Popular Yokomo DP-302 V4 is now available with Passion Red! Newly developed Quad System will enable for you to select from 4 different Mode. 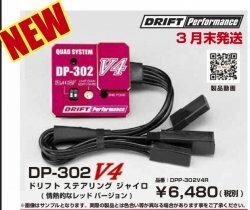 Whether you are export or newbie, DP-302 V4 Gyro will be perfect for your RC drifiting need! * Using Thin aluminium Case compare to older model. * Gold bevel edge will give you bling factor to your machine!